Study this chart and analyse it before opting optional subjects. Pardon my ignorance sir, i couldn't understand the chart. firstly, No of probationers in 36th common less than 195, 37th common approximately 348, 38th common approximately 240 what does this actually mean? if you could explain to me alittle? Secondly, what does the highlighted spaces ( blue n red) indicate? There were 195 or less than 195 members/CSPs in 36th common training programme, 348 CSPs in 37th CTP, 240 IN 38th CTP. After passing CSS and allocation, all the selected candidates go through training in civil Services Academy which is known as Common Training Programme OR CTP. This data has been compiled from the information obtained from three batches at CSA and shows the scoring trend of different optional subjects. Blue and red box simply indicate high scoring subjects. 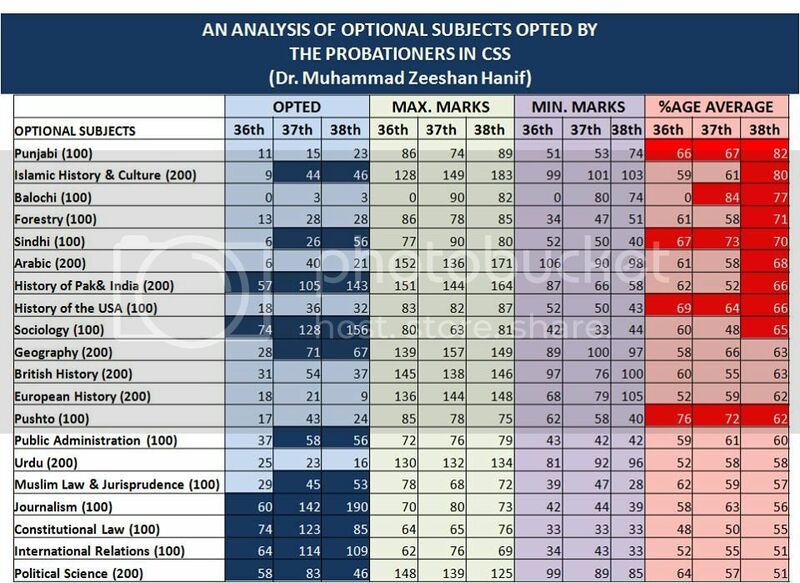 In 36th CTP, 11 CSPs opted Punjabi as their optional subject, maximum marks obtained by one CSP out of these 11 were 86, minimum marks among these 11 CSPs= 51 and average of all the 11 CSPs for Punjabi was 66. It means Punjabi is a high scoring subject and if you can read and write Punjabi you can choose it as your optional subject in next CSS exam. similarly you can interpret the remaining data. Great Work Bro!!! Its really a great help for the aspirants..Behind this chart there is a pure work and commitment..But i have a request, will you please make another chart on subject analysis of 40th common, as I assume most of the probationers must me in your contact now..I know it will consume time and the money technically..we will be waiting for your next analysis.. I got this chart from Civil Services Academy after lot of efforts because they were not allowing to make this chart public.It took months to compile it.No other analysis is available yet. "Wa tu izzu man-ta shaa, wa tu zillu man-ta shaa"
Dear sir, can you please tell me, does not this chart necessarily mean none of the CSPs opted Maths and Physics? Dear Lord thanks for your help. can anyone tell me what does 36th,37th,38th's meanings?????????????? These are indicating particular batch of CSP's. When one question mark is enough to serve the purpose then there is no need to put more than one.